Sir Christopher Frank Carandini Lee CBE CStJ (27 May 1922 – 7 June 2015) was an English actor, singer, and author. With a career spanning nearly 70 years, Lee initially portrayed villains and became best known for his role as Count Dracula in a sequence of Hammer Horror films. His other film roles include Francisco Scaramanga in the James Bond film The Man with the Golden Gun (1974), Saruman in The Lord of the Rings film trilogy (2001–2003) and The Hobbit film trilogy (2012–2014), and Count Dooku in the final two films of the Star Wars prequel trilogy (2002 and 2005). Lee was knighted for services to drama and charity in 2009, received the BAFTA Fellowship in 2011, and received the BFI Fellowship in 2013. Lee considered his best performance to be that of Pakistan's founder Muhammad Ali Jinnah in the biopic Jinnah (1998), and his best film to be the British horror film The Wicker Man (1973). He frequently appeared opposite Peter Cushing in Hammer Horror films, and late in his career had roles in six Tim Burton films. Always noted as an actor for his deep, strong voice, Lee was also known for his singing ability, recording various opera and musical pieces between 1986 and 1998, and the symphonic metal album Charlemagne: By the Sword and the Cross in 2010, after having worked with several metal bands since 2005. The heavy metal follow-up Charlemagne: The Omens of Death was released on 27 May 2013, Lee's 91st birthday. He was honoured with the "Spirit of Metal" award at the 2010 Metal Hammer Golden Gods Awards ceremony. Lee died from complications of respiratory problems and heart failure on the morning of 7 June 2015, at the age of 93. His mother separated from Rose, and Lee had to get a job, his sister already working as a secretary for the Church of England Pensions Board. With most employers on or preparing to go on summer holidays, there were no immediate opportunities for Lee, and so he was sent to the French Riviera, where his sister was on holiday with friends. On his way there he stopped briefly in Paris, where he stayed with the journalist Webb Miller, a friend of Rose, and witnessed the execution of Eugen Weidmann, the last person to be executed in public in France. Arriving in Menton, he stayed with the Russian Mazirov family, living among exiled princely families. It was arranged that he should stay on in Menton after his sister had returned home, but with Europe on the brink of war, he returned to London instead. He worked as an office clerk for United States Lines, taking care of the mail and running errands. Lee reported to RAF Uxbridge for training and was then posted to the Initial Training Wing at Paignton. After he had passed his exams in Liverpool, the British Commonwealth Air Training Plan meant that he travelled on the Reina del Pacifico to South Africa, then to his posting at Hillside, at Bulawayo in Southern Rhodesia. Training with de Havilland Tiger Moths, Lee was having his penultimate training session before his first solo flight, when he suffered from headaches and blurred vision. The medical officer hesitantly diagnosed a failure of his optic nerve, and he was told he would never be allowed to fly again. Lee was devastated, and the death of a fellow trainee from Summer Fields only made him more despondent. His appeals were fruitless, and he was left with nothing to do. He was moved around to different flying stations, before going to Salisbury in December 1941. He then visited the Mazowe Dam, Marandellas, the Wankie Game Reserve and the ruins of Great Zimbabwe. Thinking he should "do something constructive for my keep", he applied to join RAF Intelligence. His superiors praised his initiative, and he was seconded into the Rhodesian Police Force and was posted as a warder at Salisbury Prison. He was then promoted to leading aircraftman and moved to Durban in South Africa, before travelling to Suez on the Nieuw Amsterdam. Returning to London in 1946, Lee was offered his old job back at Beecham's, with a significant raise, but he turned them down as "I couldn't think myself back into the office frame of mind." The Armed Forces were sending veterans with an education in the Classics to teach at universities, but Lee felt his Latin was too rusty and didn't care for the strict curfews. Having lunch with his cousin Nicolò Carandini, now the Italian Ambassador to Britain, Lee was detailing his war wounds when Carandini said, "Why don't you become an actor, Christopher?" 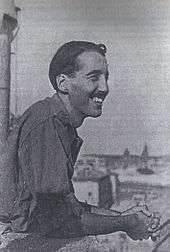 Lee liked the idea and after assuaging his mother's protests by pointing to the successful Carandini performers in Australia, which included his great-grandmother Marie Carandini, who had been a successful opera singer, he met Nicolò's friend Filippo Del Giudice, a lawyer-turned-film producer. The head of Two Cities Films, part of the Rank Organisation, Giudice, "looked me up and down... [and] concluded that I was just what the industry had been looking for". He was sent to see Josef Somlo for a contract, who immediately announced that he was "much too tall to be an actor". Somlo sent him to see Rank's David Henley and Olive Dodds, who signed him on a seven-year contract. Lee's first film for Hammer was The Curse of Frankenstein (1957), in which he played Frankenstein's monster, with Peter Cushing as Baron Victor Frankenstein. It was the first film to co-star Lee and Cushing, who ultimately appeared together in over twenty films and became close friends. When he arrived at a casting session for the film, "they asked me if I wanted the part, I said yes and that was that". A little later, Lee co-starred with Boris Karloff in the film Corridors of Blood (1958), but Lee's own appearance as Frankenstein's monster led to his first appearance as the Transylvanian vampire in the film Dracula (1958, known as Horror of Dracula in the United States). Lee accepted a similar role in an Italian-French horror picture called Uncle Was a Vampire (1959). Lee starred in two further Dracula films for Hammer in the early 1970s, both of which attempted to bring the character into the modern-day era. These were not commercially successful: Dracula A.D. 1972 (1972) and The Satanic Rites of Dracula (1973). The film was tentatively titled Dracula Is Dead... and Well and Living in London, a parody of the stage and film musical revue Jacques Brel Is Alive and Well and Living in Paris, but Lee was not amused. Speaking at a press conference in 1973 to announce the film, Lee said, "I'm doing it under protest... I think it is fatuous. I can think of twenty adjectives – fatuous, pointless, absurd. It's not a comedy, but it's got a comic title. I don't see the point." The Satanic Rites Of Dracula was the last Dracula film that Christopher Lee played the Dracula role in, as he felt he had played the part too many times and that the Dracula films had deteriorated in quality. Hammer went on to make one more Dracula film without him: The Legend of the 7 Golden Vampires (1974), with John Forbes-Robertson playing the Count and David de Keyser dubbing him. Like Cushing, Lee also appeared in horror films for other companies during the 20-year period from 1957 to 1977. 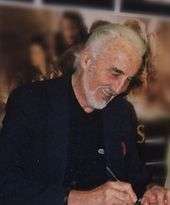 Other films in which Lee performed include the series of Fu Manchu films made between 1965 and 1969, in which he starred as the villain in heavy oriental make-up; I, Monster (1971), in which he played Jekyll and Hyde; The Creeping Flesh (1972); and his personal favourite, The Wicker Man (1973), in which he played Lord Summerisle. Lee wanted to break free of his image as Dracula and take on more interesting acting roles. He met with screenwriter Anthony Shaffer, and they agreed to work together. Film director Robin Hardy and British Lion head Peter Snell became involved in the project. Shaffer had a series of conversations with Hardy, and the two decided that it would be fun to make a horror film centering on "old religion", in sharp contrast to the popular Hammer films of the day. Shaffer read the David Pinner novel Ritual, in which a devout Christian policeman is called to investigate what appears to be the ritual murder of a young girl in a rural village, and decided that it would serve well as the source material for the project. Shaffer and Lee paid Pinner £15,000 for the rights to the novel, and Schaffer set to work on the screenplay. However, he soon decided that a direct adaptation would not work well, and began to craft a new story, using only the basic outline of the novel. Lee was so keen to get the film made, he gave his services for free, as the budget was so small. He would later refer to the film as the best he had ever made. Lee appeared in The Return of Captain Invincible (1982), a comedy-musical film. Lee plays a fascist who plans to rid America (and afterwards, the world) of all non-whites. Lee sings on two tracks in the film ("Name Your Poison" and "Mister Midnight"), written by Richard O'Brien (who had written The Rocky Horror Picture Show seven years previously) and Richard Hartley. Later, he appeared alongside Reb Brown and Sybil Danning in Howling II: Your Sister Is a Werewolf (1985). Lee made his last appearances as Sherlock Holmes in Incident at Victoria Falls (1991) and Sherlock Holmes and the Leading Lady (1992). Lee played Saruman in the The Lord of the Rings film trilogy. In the commentary, he states he had a decades-long dream to play Gandalf, but that he was now too old, and that his physical limitations prevented him from being considered. The role of Saruman, by contrast, required no horseback riding and much less fighting. Lee had met J. R. R. Tolkien once (making him the only person involved in The Lord of the Rings film trilogy to have done so) and made a habit of reading the novels at least once a year. In addition, he performed for the album The Lord of the Rings: Songs and Poems by J.R.R. Tolkien in 2003. Lee's appearance in the final film in the trilogy, The Lord of the Rings: The Return of the King, was cut from the theatrical release, but the scene was reinstated in the extended edition. In 2010, Lee marked his fourth collaboration with Tim Burton by voicing the Jabberwocky in Burton's adaptation of Lewis Carroll's classic book Alice in Wonderland, alongside Johnny Depp, Helena Bonham Carter, and Anne Hathaway. While he only had two lines, Burton said that he felt Lee to be a good match for the iconic character, because of Lee himself being "an iconic guy". A month before his death, Lee had signed to star with an ensemble cast in the Danish film The 11th. Lee recorded his final words for film at his Redwood Studios in Soho, London on 17 May 2015 just 3 weeks before his death on the 11th June 2015. Lee provided the voice for the role of Ansem the Wise/DiZ in the video games Kingdom Hearts II, Kingdom Hearts 358/2 Days, and Kingdom Hearts 2.5 HD Remix, but veteran voice actor Corey Burton (who would also take over for Lee in Star Wars: The Clone Wars) took over for Kingdom Hearts Re:Chain of Memories, Kingdom Hearts Birth by Sleep, and Kingdom Hearts 3D: Dream Drop Distance, as well as the version of Kingdom Hearts 358/2 Days that was released as part of Kingdom Hearts 1.5 HD Remix. He was the voice of Lucan D'Lere in the trailers for EverQuest II. In 2005, Lee provided the voice of Pastor Galswells in The Corpse Bride, co-directed by Tim Burton and Mike Johnson. He served as the narrator on The Nightmare Before Christmas' poem, written by Tim Burton as well. Lee reprised his role as Count Dooku in the Star Wars: The Clone Wars 2008 animated film, but Corey Burton took his place for the character in the TV series. In 2010, he collaborated again with Tim Burton, this time by voicing the Jabberwocky in Burton's adaptation of Lewis Carroll's classic book Alice in Wonderland. Some thirty years after playing Francisco Scaramanga in The Man with the Golden Gun, Lee provided the voice of Scaramanga in the video game GoldenEye: Rogue Agent. In 2013, Cristopher Lee voiced The Earl of Earl’s Court in the BBC Radio 4 radio play Neverwhere by Neil Gaiman. Lee recorded special dialogue, in addition to serving as the Narrator, for the Lego The Hobbit video game released in April 2014. With his operatic bass voice, Lee sang on the The Wicker Man soundtrack, performing Paul Giovanni's composition, "The Tinker of Rye". He sang the closing credits song of the 1994 horror film Funny Man. His most notable musical work on film, however, appears in the superhero comedy/rock musical The Return of Captain Invincible (1983), in which Lee performs a song and dance number called "Name Your Poison", written by Richard O'Brien. In 1977 he appeared on Peter Knight and Bob Johnson's (from Steeleye Span) concept album The King of Elfland's Daughter. In the 1980s, during the height of Italo disco, he provided vocals to Kathy Joe Daylor's song "Little Witch". Lee's first contact with heavy metal music came by singing a duet with Fabio Lione, lead vocalist of the Italian symphonic power metal band Rhapsody of Fire (and a member of Angra), on the single "The Magic of the Wizard's Dream" from the Symphony of Enchanted Lands II album. Later he appeared as a narrator on the band's four albums Symphony of Enchanted Lands II – The Dark Secret, Triumph or Agony, The Frozen Tears of Angels, and From Chaos to Eternity, as well as on the EP The Cold Embrace of Fear – A Dark Romantic Symphony, portraying the Wizard King. He also worked with Manowar while they were recording a new version of their first album, Battle Hymns. The original voice was done by Orson Welles (who was long dead at the time of the re-recording). The new album, Battle Hymns MMXI, was released on 26 November 2010. On his 90th birthday (27 May 2012) he announced the release of his new single "Let Legend Mark Me as the King" from his upcoming album Charlemagne: The Omens of Death, signifying his move onto "full on" heavy metal, which makes him the oldest performer in the history of the genre. The music was arranged by Richie Faulkner from the band Judas Priest, and featured World Guitar Idol Champion, Hedras Ramos. On the self-titled debut album by Hollywood Vampires, a supergroup consisting of Johnny Depp, Alice Cooper, and Joe Perry, Lee is featured as a narrator in the track "The Last Vampire". Being recorded shortly before his death, this marks Lee's final appearance on a musical record. Lee was engaged for a time in the late 1950s to Henriette von Rosen, whom he had met at a nightclub in Stockholm. Her father, Count Fritz von Rosen, proved demanding, getting them to delay the wedding for a year, asking his London-based friends to interview Lee, hiring private detectives to investigate him, and asking Lee to provide him with references, which Lee obtained from Douglas Fairbanks, Jr., John Boulting, and Joe Jackson. Lee found the meeting of her extended family to be like something from a surrealist Luis Buñuel film, and thought they were "killing me with cream". Finally, Lee had to have the permission of the King of Sweden to marry. Lee had met him some years before whilst filming Tales of Hans Anderson, where he received his blessing. However, shortly before the wedding, Lee ended the engagement. He was concerned that his financial insecurity in his chosen profession meant that she "deserved better" than being "pitched into the dishevelled world of an actor". She understood, and they called the wedding off. Lee was introduced to Danish painter and former model Birgit "Gitte" Krøncke by a Danish friend in 1960. They were engaged soon after, and married on 17 March 1961. They had a daughter, Christina Erika Carandini Lee (b. 1963), who married Juan Francisco Aneiros Rodriguez in July 2001. Lee was also the uncle of the British actress Dame Harriet Walter. Both Lee and his daughter Christina provided spoken vocals on Rhapsody of Fire's album From Chaos to Eternity. Lee was also known for his imposing height (he stood at 6 ft 5 in (1.96 m tall)). 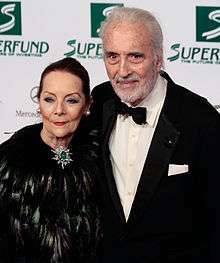 Lee and his wife Birgit were listed among the fifty best-dressed over 50s by the Guardian in March 2013. Lee was a supporter of the British Conservative Party. He described Michael Howard as "the ideal person to lead the party" in 2003, and also supported William Hague and David Cameron. Following Lee's death, fans, friends, actors, directors, and others involved in the film industry publicly gave their personal tributes. He was also honored by the Academy at the 88th Academy Awards in the annual In Memoriam section. Lee was the subject of This Is Your Life in 1974, where he was surprised by Eamonn Andrews. In 1997, he was appointed a Commander of the Venerable Order of Saint John. On 16 June 2001, as part of that year's Queen's Birthday Honours, Lee was appointed a Commander of the Order of the British Empire "for services to Drama". He was made a Knight Bachelor "For services to Drama and to Charity" on 13 June as part of the Queen's Birthday Honours in 2009. He was knighted by Prince Charles, but because of his age he was excused the usual requirement to kneel, and thus received the knighthood whilst standing. The government of France made him a Commander of Ordre des Arts et des Lettres in 2011. In 2011, accompanied by his wife Birgit, and on the 164th anniversary of the birth of Bram Stoker, Lee was honoured with a tribute by University College Dublin, and described his honorary life membership of the UCD Law Society as "in some ways as special as the Oscars". He was awarded the Bram Stoker Gold Medal by the Trinity College Philosophical Society, of which Stoker was President, and a copy of Collected Ghost Stories of MR James by Trinity College's School of English. The government of France made him a Commander of the Order of Arts and Letters in 2011. 1 2 3 4 5 6 7 8 9 10 11 12 13 14 15 "The Total Film Interview – Christopher Lee". Total Film. 1 May 2005. Archived from the original on 12 June 2007. Retrieved 25 August 2013. ↑ "Christopher Lee filmography". AllMovie. AllRovi. Retrieved 18 December 2015. ↑ "Sir Christopher Lee releases second heavy metal album". BBC News. ↑ Farrell, John (28 May 2012). "Christopher Lee Celebrates 90th Birthday By Recording Heavy Metal". Forbes. Retrieved 29 May 2012. ↑ "Biography – Christopher Lee – Official Website". Christopherleeweb.com. Archived from the original on 24 February 2014. Retrieved 16 March 2014. ↑ "Christopher Lee – Biography". Talk Talk. Retrieved 26 August 2013. ↑ James E. Wise; Scott Baron (January 2002). International Stars at War. Naval Institute Press. p. 118. ISBN 978-1-55750-965-9. 1 2 Lee 2003, p. 38. ↑ "Christopher Lee biography". Retrieved 18 April 2013. 1 2 Lee 2003, p. 50. ↑ Louis Paul (6 September 2007). Tales from the Cult Film Trenches: Interviews with 36 Actors from Horror, Science Fiction and Exploitation Cinema. McFarland. pp. 146–. ISBN 978-0-7864-8402-7. ↑ The London Gazette: (Supplement) no. 36044. pp. 2619–2620. 4 June 1943. ↑ The London Gazette: (Supplement) no. 36131. pp. 3636–3637. 10 August 1943. 1 2 Lee 2003, p. 107. 1 2 3 4 "Christopher Lee: a giant among actors". The Times. 20 November 2009. Retrieved 20 December 2012. ↑ Lee 2003, p. 61. ↑ Lee 2003, p. 99. 1 2 3 4 Farndale, Nigel (12 February 2011). "Sir Christopher Lee interview". London: The Telegraph. Retrieved 20 December 2012. ↑ Lee 2003, p. 109. ↑ Lee 2003, p. 110. ↑ Lee 2003, p. 111. 1 2 Lee 2003, p. 112. 1 2 3 "A prolific star of the Elstree screen". Boreham Wood & Elstree Times. 16 February 2006. Retrieved 20 December 2012. ↑ Landis, John (2011). Monsters in the Movies: 100 Years of Cinematic Nightmares. Dorling Kindersley. p. 45. ISBN 978-1-4053-6697-7. ↑ Haining, Peter (1992). The Dracula Scrapbook. Chancellor Press. ISBN 1-85152-195-X. ↑ Sir Christopher Lee In His Own Words. ↑ "IMDB". Retrieved 20 May 2016. 1 2 Barrett, Victoria (29 May 2003). "The good, the bad and the Christopher Lee". London: The Guardian. Retrieved 21 December 2012. ↑ Farndale, Nigel (11 June 2005). "Sir Christopher Lee interview: 'I'm softer than people think'". The Telegraph. Retrieved 16 January 2016. ↑ "Hammer House of Horrors". My Existenz. Retrieved 16 January 2016. 1 2 "Burnt Offerings: – The Cult of the Wicker Man 1/4". YouTube. 6 October 2010. Retrieved 11 April 2012. ↑ Gore, Will (22 April 2011). "The author who inspired The Wicker Man...". Surrey Comet. Archived from the original on 26 August 2011. Retrieved 11 April 2012. ↑ Lee 2003, p. 307. ↑ "Return from Witch Mountain". Turner Classic Movies. Retrieved 15 August 2015. 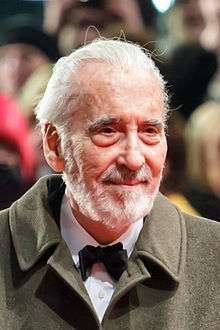 ↑ "Christopher Lee talks about his favorite role". YouTube. 21 March 2002. Retrieved 5 August 2009. ↑ Lee 2003, p. 274. ↑ Lee 2003, p. 337. ↑ Peter Jackson (2002). Cameras in Middle-earth (The Lord of the Rings: The Fellowship of the Ring Special Extended Edition documentary) (DVD). New Line Cinema. ↑ "Lord of the Rings: At Dawn in Rivendell". Amazon.com. Retrieved 4 October 2010. ↑ "Tim Burton – KCRW | 89.9FM". Kcrw.com. Retrieved 4 October 2010. ↑ "Science+Fiction Festival Report: Christopher Lee on Modern Horror Movies". Dreadcentral.com. 22 December 2009. Retrieved 4 October 2010. ↑ "The Resident – review". The Guardian. 10 March 2011. Retrieved 2 January 2014. ↑ "Hi-Res Look at Hilary Swank in Hammer Films' 'The Resident'". Bloody-disgusting.com. Retrieved 4 October 2010. ↑ "Robin Hardy – director and novelist – Edward Woodward and Christopher Lee". Geek Chocolate. 6 April 2012. Retrieved 20 December 2012. ↑ Hardy, Robin. "RM-051.mp3 (audio/mpeg Object)". Rue Morgue Radio. Archived from the original on 20 May 2013. Retrieved 12 April 2012. ↑ Lee, Christopher (27 December 2011). "Christopher Lee 2011 Christmas Message Part 1". Retrieved 11 April 2012. ↑ "Sir Christopher Returns in The Hobbit". Christopher Lee Official Website. 11 January 2011. Archived from the original on 15 January 2011. Retrieved 11 January 2011. ↑ Ferris, Glen (4 June 2008). "Christopher Lee on The Hobbit". Empire Online. Retrieved 4 June 2008. ↑ Rappe, Elisabeth (13 July 2008). "Looks Like Christopher Lee Might Not Return to Middle-Earth". Cinematical. Archived from the original on 14 July 2008. Retrieved 14 July 2008. ↑ "Christopher Lee Talks Saruman in The Hobbit: An Unexpected Journey". Movie Web. 31 December 2011. Retrieved 20 December 2012. ↑ "Johnny Depp Retirement Saddens Christopher Lee". Movie Web. 10 August 2013. Retrieved 25 August 2013. ↑ "New clip from the DC comics villains documentary Necessary Evil, narrated by Christopher Lee!". JoBlo.com. 22 October 2013. Retrieved 31 December 2013. ↑ "How to be Sherlock Holmes: The Many Faces of a Master Detective". BBC. Retrieved 21 March 2014. ↑ "Web exclusive: Christopher Lee reads The Final Problem". BBC Four. 23 December 2013. Retrieved 21 March 2014. ↑ Shah, Yagana (19 March 2014). "PSA Reminds Us To Love Later Life And Embrace Aging". JoBlo.com. Retrieved 21 March 2014. ↑ Ben Child (19 May 2015). "Christopher Lee and Uma Thurman attached to 9/11 drama set in Denmark". The Guardian. Retrieved 21 May 2015. ↑ Michael Rosser (11 June 2015). "Christopher Lee dies aged 93=Screen International". Retrieved 17 October 2016. ↑ "Regent Street Cinema Listings". 12 October 2016. Retrieved 17 October 2016. ↑ Christopher Lee's last words in the film Angels in Notting Hill. Michael Pakleppa. 17 May 2015. Retrieved 17 October 2016. 1 2 3 "Extensive biography at Tiscali UK". Tiscali.co.uk. Retrieved 4 October 2010. ↑ The EA Games website, URL accessed 2 May 2006. Archived 14 March 2006 at the Wayback Machine. ↑ The BBC Radio 4 website, URL accessed 12 July 2016. ↑ Steve Anderson. ""Funny Man" DVD Review". Retrieved 29 April 2007. ↑ "Battle Hymns 2011 – Born To Live Forevermore". Manowar.com. 4 November 2010. Archived from the original on 1 November 2010. Retrieved 4 November 2010. ↑ "Video clip at christopherleeweb.com". Web.archive.org. 11 October 2007. Archived from the original on 11 October 2007. Retrieved 15 November 2011. ↑ "Christopher Lee Is Metal!". Dreadcentral.com. 15 March 2010. Retrieved 4 October 2010. ↑ Blabbermouth Archived 6 June 2011 at the Wayback Machine.. Retrieved 1 January 2010. ↑ "Have a heavy metal Christmas with Christopher Lee". Metro.com. 20 December 2012. Retrieved 21 December 2012. ↑ "If Christopher Lee's Christmas rock anthem Jingle Hell doesn't make you feel festive nothing will". Metro.com. 14 December 2013. Retrieved 15 December 2013. 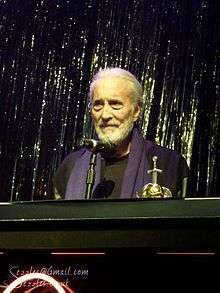 ↑ "CHRISTOPHER LEE Lands On Billboard Hot Singles Sales Chart With Heavy Metal Take On 'Jingle Bells'". Blabbermouth. 25 December 2013. Retrieved 31 December 2013. 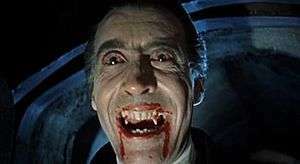 ↑ "'DRACULA' ICON CHRISTOPHER LEE BECOMES OLDEST MUSICIAN TO CHART ON BILLBOARD AT 91 YEARS OLD". Loudwire. 27 December 2013. Retrieved 31 December 2013. ↑ "92-Year-Old Actor Christopher Lee Offers Metal Christmas Song 'Darkest Carols, Faithful Sing'". Loudwire. 9 December 2014. Retrieved 9 December 2014. ↑ "Legendary Actor CHRISTOPHER LEE Releases New Heavy Metal Single 'Darkest Carols, Faithful Sing'". Blabbermouth. 9 December 2014. Retrieved 9 December 2014. ↑ "See Johnny Depp, Alice Cooper, Joe Perry Jam With Rock Royalty". Rolling Stone. Retrieved 15 August 2015. 1 2 Christopher Lee, 'Lord of Misrule'. ↑ Lee 2003, p. 181. ↑ Lee 2003, p. 182-183. 1 2 Lee 2003, p. 184. ↑ Lee 2003, p. 185-186. ↑ Lee 2003, p. 196-198. ↑ Lee 2003, p. 199. ↑ Prepolec, Charles (27 July 2001). "To the Bride and Groom!". Christopher Lee Web. Archived from the original on 16 August 2013. Retrieved 4 May 2012. ↑ "Stuck on you. Horror star flies into Notts". BBC. 31 July 2001. Retrieved 20 December 2012. ↑ "Christopher Lee: You Ask The Questions – Profiles, People". The Independent. 11 February 2009. Archived from the original on 25 September 2010. Retrieved 5 August 2009. ↑ 'Sir Christopher Lee: Screen legend dies aged 93'. ↑ Christopher Lee: readers' tributes and memories. ↑ Christopher Lee tributes led by Peter Jackson. ↑ Christopher Lee dead: Lord of the Rings co-star Ian McKellen pays tribute to on-screen rival. ↑ Sir Christopher Lee: tributes to 'titan of cinema'. ↑ Christopher Lee honoured in Oscars ceremony. ↑ The London Gazette: no. 54652. p. 595. 16 January 1997. Retrieved 30 June 2012. ↑ The London Gazette: (Supplement) no. 56237. pp. 7–8. 16 June 2001. Retrieved 30 June 2012. ↑ The London Gazette: (Supplement) no. 59090. p. 1. 13 June 2009. ↑ Sir Christopher Lee receives the insgnia of Commandeur de l'Ordre des Arts et des Lettres Embassy of France in the UK. "Christopher Lee honoured by UCD". RTÉ Ten. 9 November 2011.Archived 10 November 2011 at the Wayback Machine. ↑ Duncan, Pamela. "Lee receives Bram Stoker award". The Irish Times. 9 November 2011. ↑ William Addams Reitwiesner (2010). "The Ancestors and Relatives of William Addams Reitwiesner". Retrieved 7 September 2014. ↑ "Charlemagne Music Samples | Christopher Lee – Official Website". Christopherleeweb.com. Archived from the original on 19 September 2010. Retrieved 4 October 2010. Walker, Tim (31 May 2006). "Never Be Terrible In A Terrible Movie". The Spectator. Retrieved 17 December 2015.